Directorate of Education Delhi Recruitment 2016 – 326 Teaching Posts:- Government of National Capital Territory of Delhi, Directorate of Education has published latest notification for filling up 326 posts of Guest Educational and Vocational Guidance Counselor Teacher. Desirous & eligible candidates can apply online from 18/05/2016 to 10/06/2016. Age Limit: 30 years as on last date for receipt of online applications. Educational Qualification: Master Degree in Psychology from a recognized University or institution with Diploma in Guidance and Counselling from a recognized university. Starting Date of Online Application : 18/05/2016. Last Date of Online Application : 10/06/2016. Application Procedure : Eligible candidates can apply online through the website http://www.edudel.nic.in from 18/05/2016 to 10/06/2016. 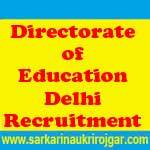 Subscribe our free job alert mail for Directorate of Education Delhi Recruitment 2016.